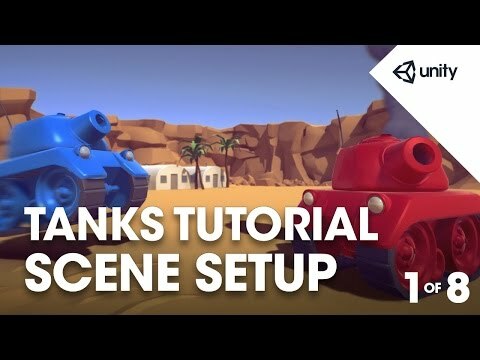 Phase 1 teaches you how to set up the base scene using the provided assets. So without further ado, this is what we're going to make today. sorry, multiplayer features built in to it. But this is all about two players on one keyboard. and have a bit of a battle with it. if that's not what you're seeing, don't worry about it at all. We're going to start by making a new scene in a moment. and choose 2 by 3. Then what I'm going to do is to grab my project panel. and drop it below the hierarchy. You're looking at a layout that's something like this. the beginner tutorials that we sent you by email. view by dragging the slider at the bottom here. If you drag it all the way to the left you will get a list view. Okay, so that's our editor setup. at me, I'll slow down. and you will find a Scenes folder. And we're just going to call this Main. drag some artwork in there and it's going to look nice. We've got our lighting setup in our Level prefab. look in the Prefabs folder in the project. and if you select it it should look something like this. So it's a little game board with all of the stuff setup. and all of this different stuff. actually go about making the game. drop it on to the hierarchy. it in the game view as well. progress bar starting down at the bottom.. So we want to change some settings for that. and it's starting to create a lighting bake. So I want you to go to Window - Lighting. just put it back at the origin by changing position to (0,0,0). if you've dragged it in to the hierarchy. Transform - Position - (0,0,0). Okay, so the lighting panel. at the bottom of the lighting panel. and then we're going to give you some settings to put in. First thing I'm going to do is remove Baked GI. they've all got lights on and they're going to light up the scene for us. we're going to set that to 0.5.
no offence Pete, it's beautiful, well done. So you can see here, directional light. supplied either by a skybox or by colour or gradient. and we're just going to set this to a colour. recap of what we've just done, okay? and the slides also have references to things. asking you guys to set it to 972, 62, 113). to make sure you're on RGB. green 62 and 113 for blue. going to be the same for X, Y and Z.
don't get confused, that's fine. Okay, so back to the editor. we're just going to click Build. and you'll see a short progress bar at the bottom. then it might take a little bit longer to bake. and we can carry on with the work that we're doing. The next thing we're going to do is to setup our camera. as you can see is kind of looking at some of the buildings. always are, which is at (0,1,-10) in the world. so that you can look at something if you put it in at 0.
to do there is to set it to orthographic projection. So as I promised we're going to do these recaps. of the camera to (-43, 42, -25). Change the rotation to (40, 60, 0). and we're going to talk a little bit about what that means. that explain that a bit better. is that size is what changes, effectively the zoom. As I drag my size value I'm effectively zooming in and out. We don't want you to do this, but it's just an example. Then the last thing that we're going to do. tanks move far apart we need to have a background color setup. from skybox to solid color. And then I'm going to choose a color for the background. desert and the RGB reference is (80, 60, 50). is that, so it kind of fits the theme. we changed that color to (80, 60, 50). but it's just a good habit to control-S or command-S if you're on a mac. all the components that you need.